Home for Life is a small, but mighty group of people that are dedicated to giving a permanent home to animals that have been rejected from rescue or shelter programs. Home for Life offers a home to older animals and animals with medical conditions or disabilities. For the nearly 200 animals that live at the Home for Life sanctuary in Minnesota, it is truly a blessing. On any given day, the residents of the sanctuary are able to play, eat, and sleep all while feeling completely secure and cared for. Most importantly, they are given the love and affection that they deserve. When we were reading through the stories about each animal, one in particular stood out. 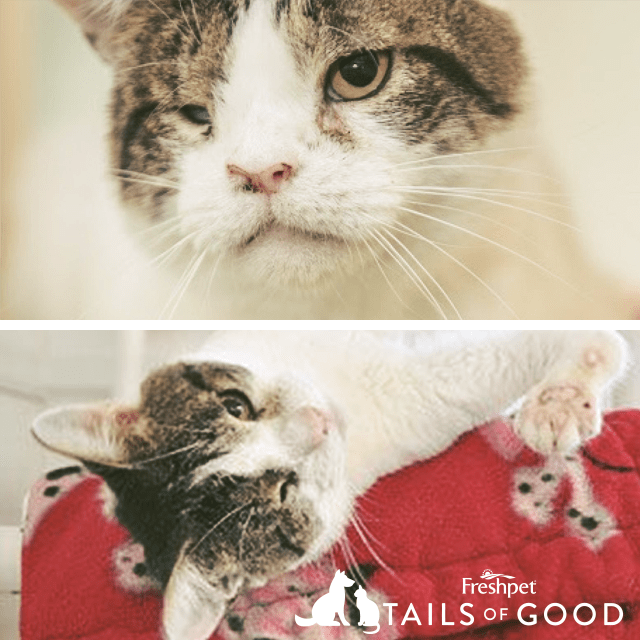 Benjamin Button is a cat that was rescued from a home where he was being underfed and neglected. The rescue group found him in dire straits, with one eye completely shut and other various injuries. He was eventually rescued and brought to the Home for Life sanctuary where he’s made an amazing recovery, and looks younger and younger by the day. We wanted to give this adorable kitty some of our own Freshpet love, so we are sending them cases of our Freshpet Select Roasted Meals for Cats, and we made a donation to the sanctuary in his name. We absolutely love the people at Home for Life and the mission they’re embarking on. Check out their site for more details. If you know of a pet or family member who deserves an Tail of Good, we want to hear from you! Email us at [email protected], or send us a message on Facebook or Twitter. You can follow all of our acts on our Tumblr page.